This post is the first in a series on Springfield mayoral candidates ahead of the September 8 preliminary. SPRINGFIELD—Salvatore Circosta and the man he seeks to replace as mayor, Domenic Sarno, have a lot in common. Both are Italian, the same generation of each’s family emigrated here, both attend mass at Mt. Carmel and both have roots in the Forest Park neighborhood. Despite this, their families have had little interaction over the years. Ultimately, distance between their families’ hometowns in Italy may be destiny. Circosta’s family hails from Martone, in Calabria (the boot), while Sarno’s comes from Bracigliano, miles to the north near Naples. More than Old World geography divides Circosta and Sarno as they tussle with the other five candidates for the preliminary on September 8th. Circosta credits Sarno on the tornado response, but panned the mayor on public engagement, economic development, crime and cronyism. Yet Circosta’s critique can seem more like disappointment with a relative than disdainful criticism of an opponent. At the Armoury-Quadrangle Civic Association’s mayoral forum (which Sarno did not attend) Circosta railed against a City Hall that only works for the well-connected. Likewise, during an interview at the sole Starbucks here, Circosta highlighted a fundraiser superlawyer Frank Fitzgerald—whose clients include MGM and the proposed biomass plant—held for Sarno at the Sheraton Paul Picknelly owns. “I think it is very clear to the voters whom the mayor serves,” he said. But will those voters turn Circosta, barely 30, who has no elected experience? He is not a wholly unknown entity. Before shuttering in 2013, Circosta’s Forest Park coffee shop hosted political events and police-community meetings, gaining him some profile. While admitting to being no municipal policy maven, Circosta said, “Look at Sarno, he doesn’t write the budget. There are experts for that.” Although in response to a question at Armoury-Quadrangle, Circosta noted experience working on St. John the Evangelist’s $1 million ecclesiastical budget. Circosta stressed the casino, Union Station and other projects offer Springfield opportunities, but the city lacks any overarching plan. He mocked Sarno’s Vision 2017 presentation as “smoke and mirrors,” a mix of tornado relief projects and failed holdover Albano-era ideas. Springfield politics is, to put it mildly, brutal and Circosta has faced greater scrutiny, including a public, if not clearly newsworthy outing as gay by The Republican. Still, he was philosophical overall. 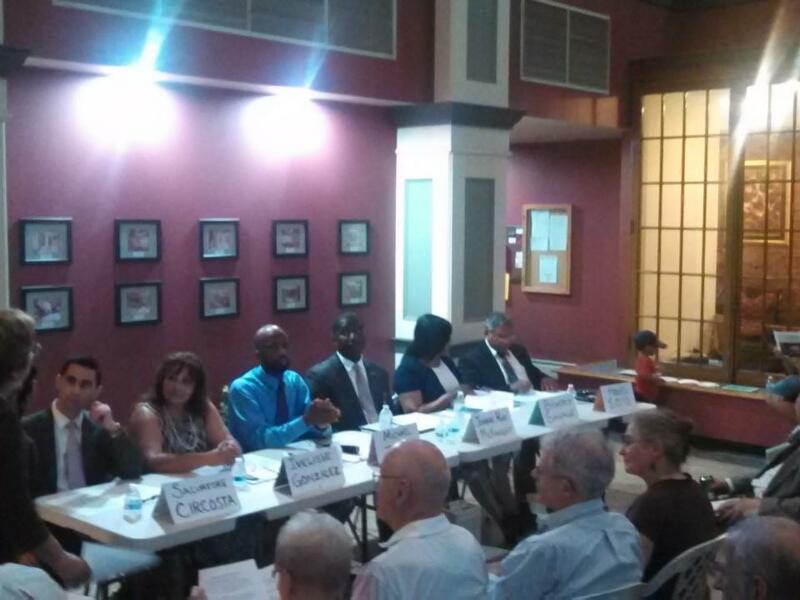 In 2013, Circosta unsuccessfully challenged Ward 3 Councilor Melvin Edwards. While victory always looked improbable, some deemed that bid half-hearted. Similar claims have arisen now—observers note fellow candidate Johnnie Ray McKnight is knocking doors, whereas Circosta is not. Nevertheless on the stump, Circosta, a one-time seminarian, presents forcefully and well. “I’m confident, absolutely,” he said of advancing to November. Circosta’s campaign has been active on social media. Some posts are nostalgic. Others blast Sarno. Though typical for a Millennial, it syncs with his belief that the city woefully underutilizes social media. Consequently, City Hall is less connected to residents, especially younger ones. Moreover, via social media the city could furnish counter narratives to the bleak picture local media often paints. The problem may go beyond Facebook, Twitter and Instagram. Circosta said the city has no webmaster or web architect. “That is not an important arm stretch for this administration,” he asserted. Incidentally, Sarno is somewhat responsible for Circosta’s policing experience by appointing him to the Community Police Hearing Board. Between that and befriending cops at his coffee shop, Circosta has developed some understanding of law enforcement. Discussing the subject, it was apparent Circosta’s campaign was partly borne out of frustration. He mentioned low officer morale and questioned staffing in the gang unit, despite most shootings being gang-related. While he has called for a new police commission and substations citywide, Circosta praised Commissioner John Barbieri and was eager to hear his advice. However, attempts to make the Hearing Board on which he sits more than merely “reactive” have been rebuffed. Well before he was a candidate, Circosta heard detectives’ cars were not properly equipped with computers and met with Sarno about it. He “told me to stay in my lane” and was not even open to the conversation. Early in the interview, Circosta called Sarno a nice guy and “a good cheerleader” for Springfield, yet “dissatisfaction with the leadership quality of the mayor” compelled him to get into the race. Perhaps Circosta and the mayor’s failure to see eye to eye is no surprise. “We are from very different parts of Italy,” Circosta said. The public would like to know more about your time at St. John’s, Mr. Circosta. Weren’t you let go from that position, sir? You are bragging about setting up a $1 million ecclesiastical budget there, yet you were not even employed there a full year, and you were let go before your contract was even up. Please, can you enlighten the good people of the City of Springfield as to why you would consider that job to be something that would help you be a good mayor?